Raumfahrt+Astronomie-Blog von CENAP - Blog: Astronomie - Terrawatch: is this how plate tectonics gets started? For those who don’t like New Year, be grateful that you live on Earth and not Venus. Although the days are long on Venus (equivalent to 116.75 Earth days), the years are short, and come around every 1.92 Venus days. With a surface that seized up hundreds of millions of years ago, temperatures of more than 460C, and clouds of sulphuric acid, this isn’t a friendly planet. However, its crust may be more lively than we had thought. Images from the Magellan mission in the 90s showed narrow mountain ranges and valleys on the surface of Venus. Recently, Paul Byrne from North Carolina State University revisited these images and noticed that these ridges and valleys often surround low areas that were later filled with lava. These features reminded Byrne and his colleagues of the large chunks of continental crust on Earth, such as the Sichuan Basin in China, which pummel their surroundings and create mountains and valleys at their edges as they jostle around. The planetary scientists speculate that the scorching temperatures on Venus might heat the crust enough to allow some parts to detach slightly from the underlying mantle, creating thin crustal blocks that can “jiggle” around, just like on Earth. “It may help us understand how plate tectonics gets started,” says Byrne, who presented his findings at the American Geophysical Union’s autumn meeting in New Orleans. More exciting still, Byrne and his colleagues noticed that some of the ridges cross into the lava plains they surround, suggesting that this jiggling has happened more recently. 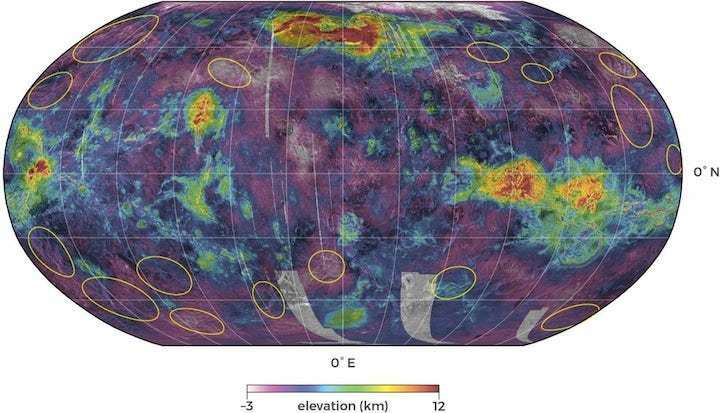 Could Venus be trying to break into a plate-tectonic dance? 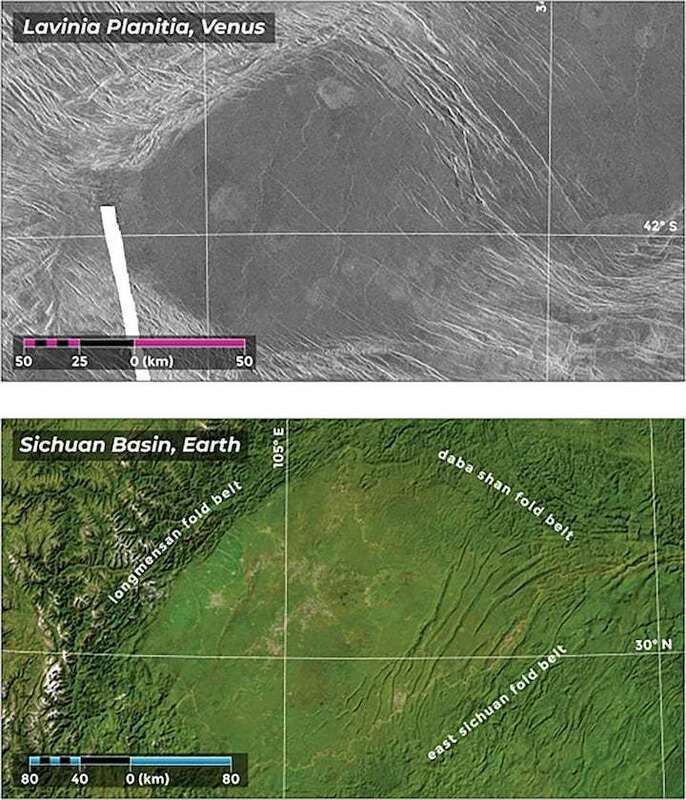 The Lavinia Planitia area of Venus (top) and the Sichuan Basin, China. A Japanese spacecraft that is circling Venus has beamed home pictures of one of the largest waves ever seen in the solar system. The Akatsuki probe captured images of the giant wave in the Venusian cloud tops where it became one of the most prominent features in the planet’s atmosphere for four days in December 2015. Cameras onboard the spacecraft recorded the pressure wave in the atmosphere stretching over 10,000km (6,214 miles) from the northern polar region across the equator to the planet’s southern pole. Named after the Roman goddess of love and beauty, Venus is the second rock from the sun and the hottest planet in the solar system thanks to a runaway greenhouse effect that makes temperatures top 460C (860F) – above those found even on Mercury. 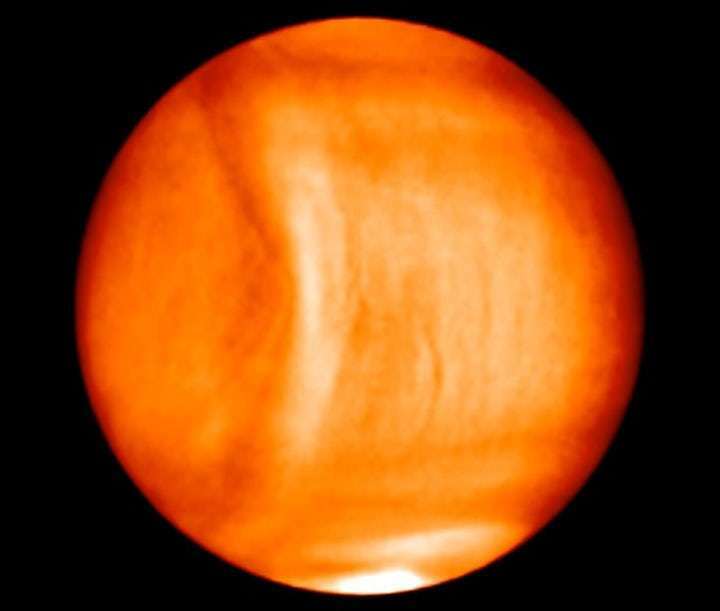 Scientists at the Japanese space agency believe that surface winds produced the massive stationary wave on Venus when they slammed into the 4,500-metre-high (14,764 feet) Aphrodite Terra mountain range near the planet’s equator. “Such stationary waves can have a very large scale, perhaps the greatest ever observed in the solar system,” the researchers write in the journal Nature Geoscience. The unusual waves may even be powerful enough to affect the climate on the planet, the scientists add. The Akatsuki spacecraft used infrared and ultraviolet cameras to capture images of the enormous wave 65km (40 miles) above the ground in the thick sulphuric acid clouds that shroud the planet. The centre of the wave was directly above the western slope of the Aphrodite Terra highlands. On Venus, clouds sweep by at 350km per hour (217 miles per hour), which is much faster than the speed at which the planet rotates beneath. The planet spins so slowly that a day on Venus lasts longer than a year there. The Japanese spacecraft swung into orbit around Venus in December 2015 and snapped pictures of the wave until the observations were cut short to allow mission controllers to work on the spacecraft’s trajectory and communications.